For installation of the Imixs-BPMN Modeler, you will need an executable Eclipse installation (version Eclipse Oxygen or higher) or any other Eclipse based IDE (e.g. Oracle, SAP, IBM). If you do not have an Eclipse installation yet, you can download Eclipse from the Eclipse website. 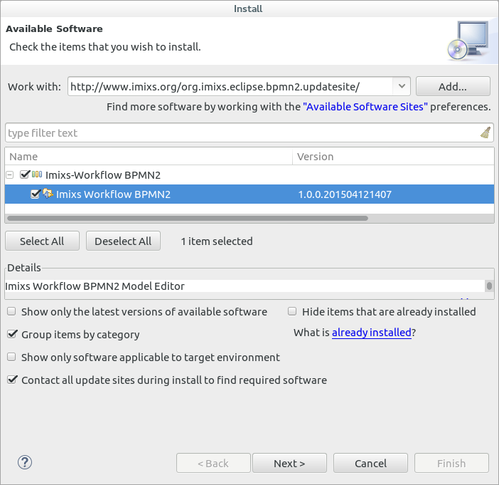 Imixs-BPMN is installed the same way as any other Eclipse plugin.To install the Imixs-BPMN plugin select from the Eclipse Workbench main menu: Help -> Install New Software. Finally you have to restart your Eclipse IDE.